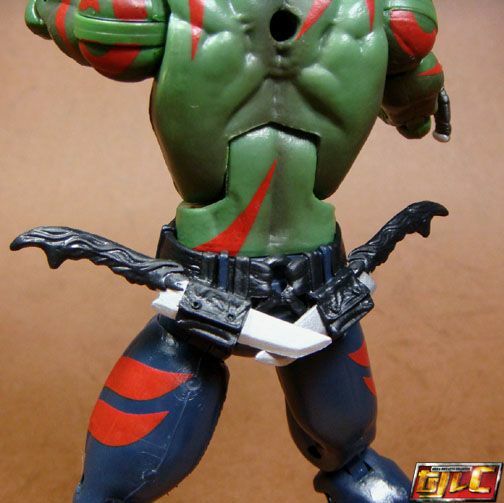 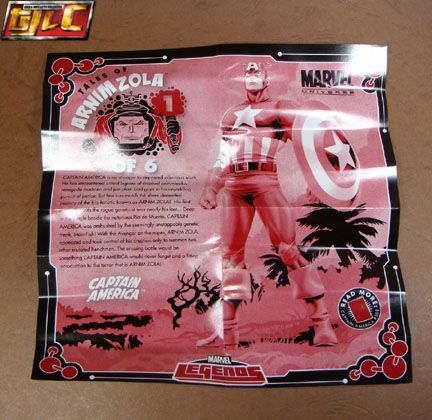 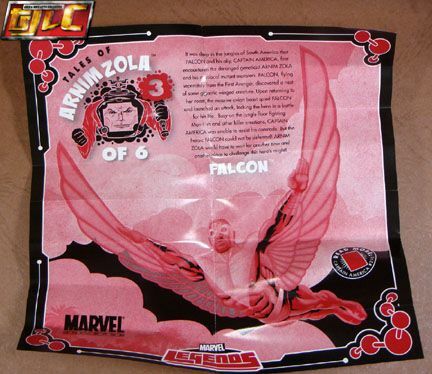 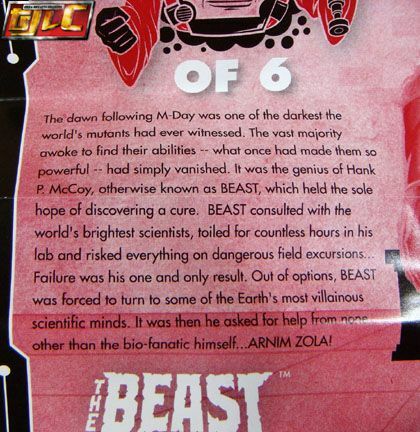 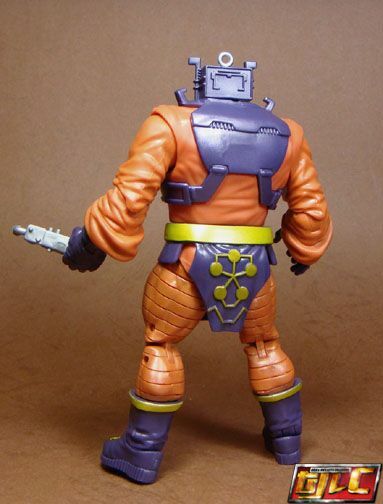 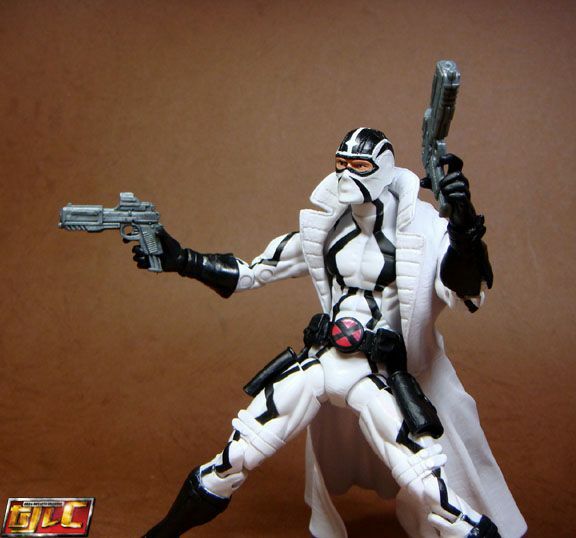 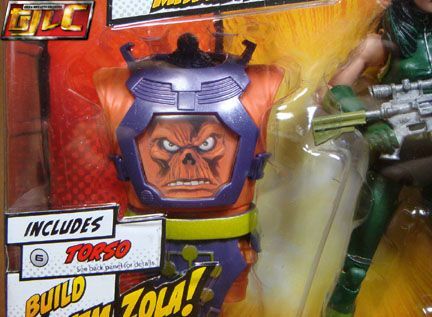 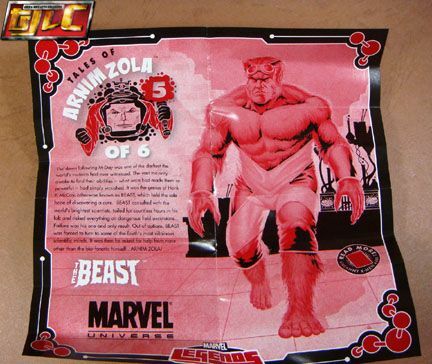 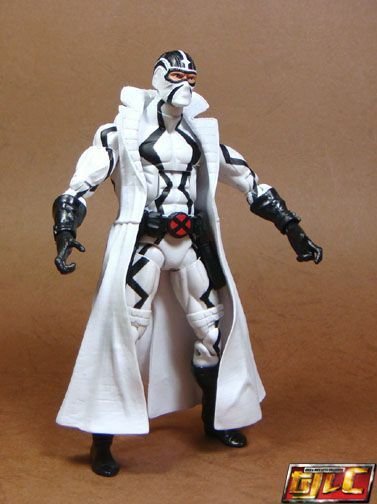 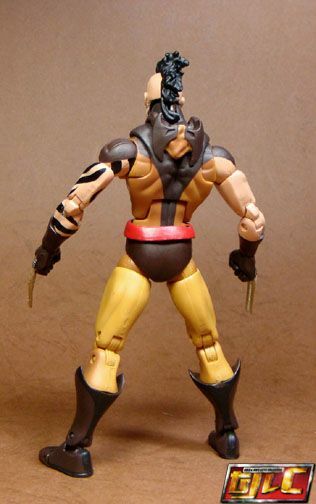 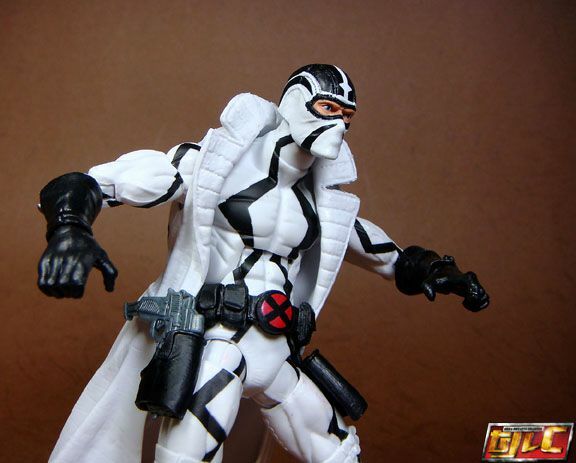 It’s too bad the “masked” version is harder to find, even on Ebay. 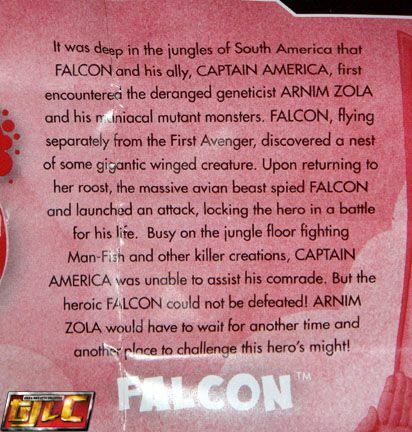 Hope it gets better distribution later. 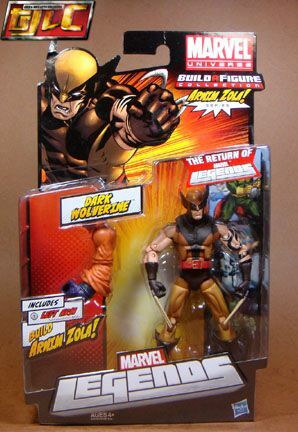 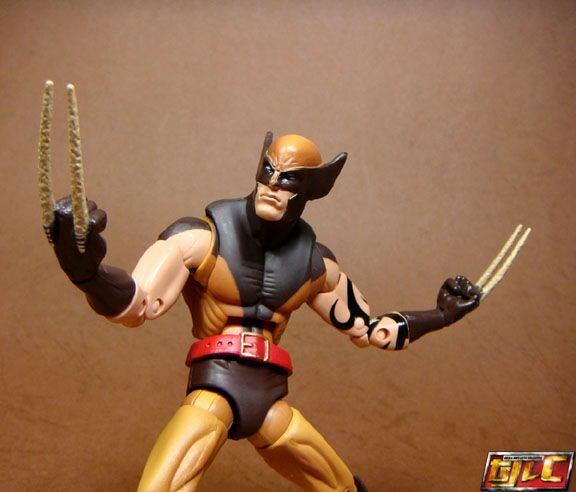 What is up with the 2 claws? 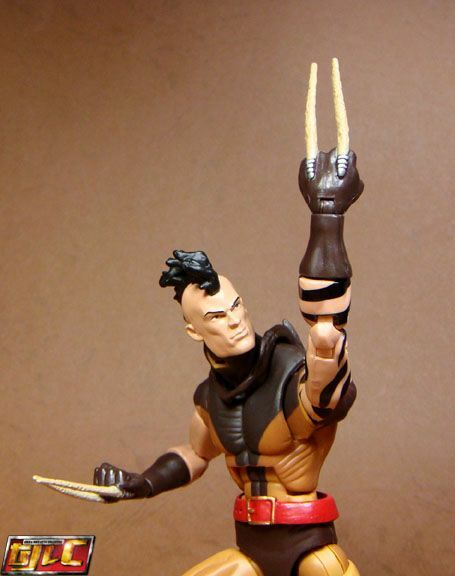 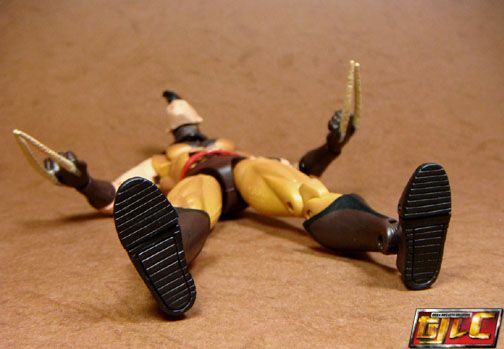 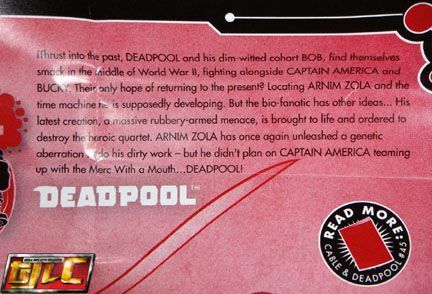 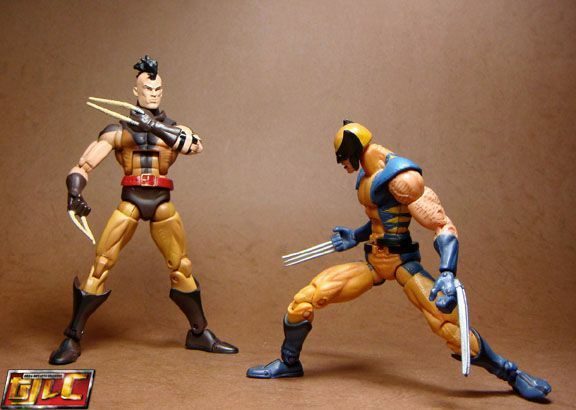 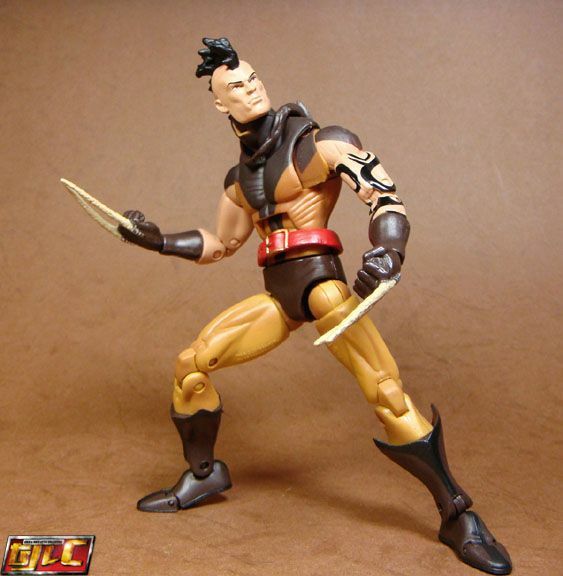 First X-23, now Daken? 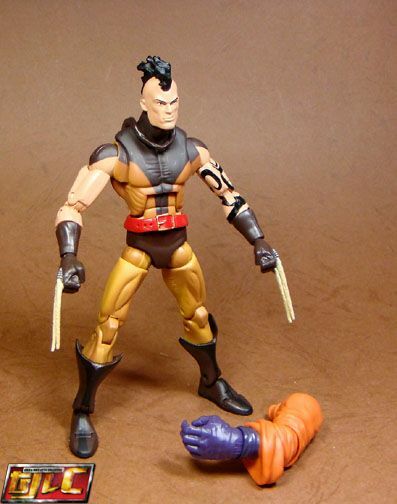 Does that mean the next generation will only have 1 claw left? 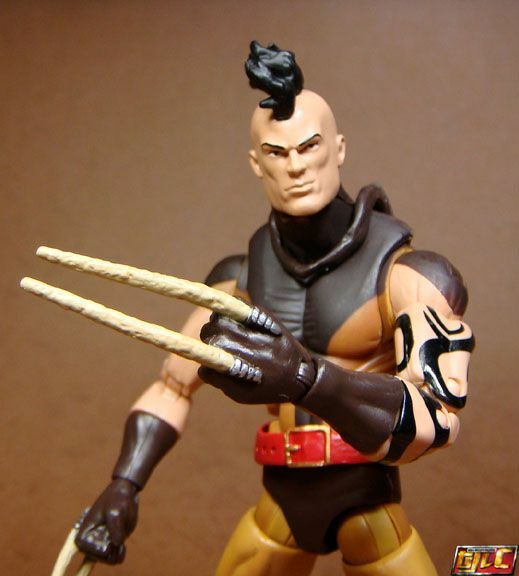 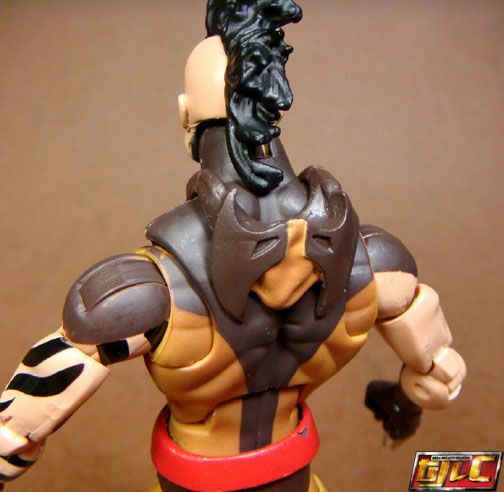 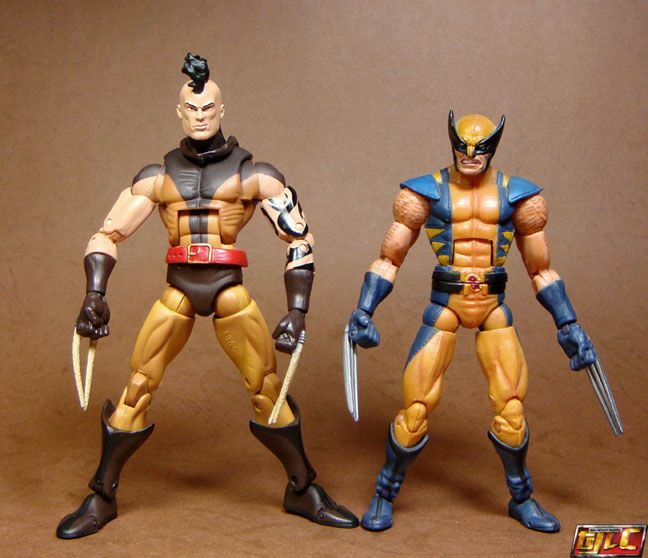 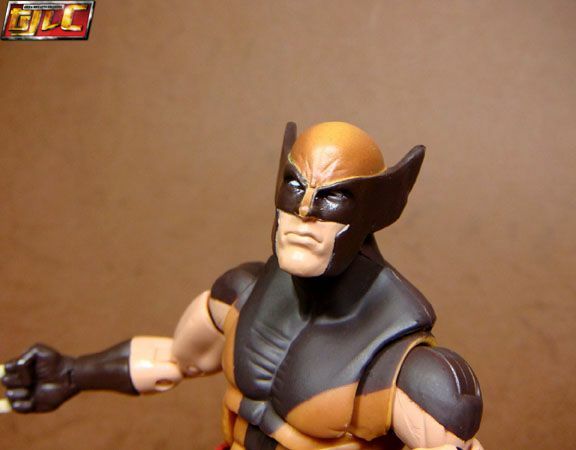 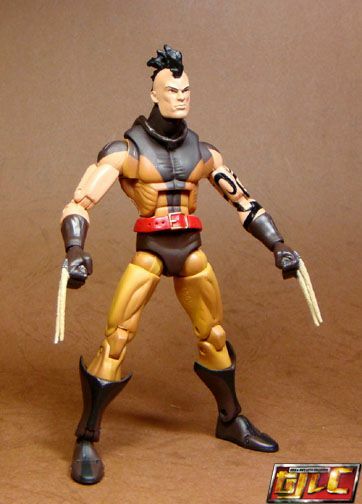 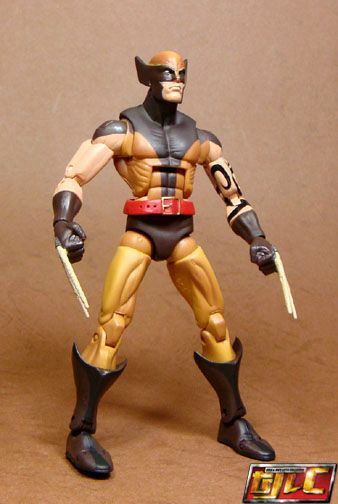 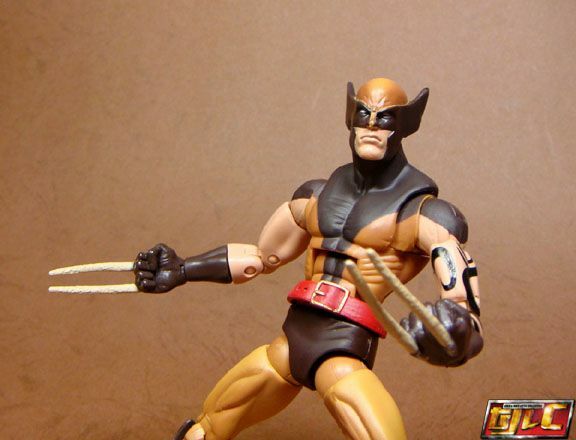 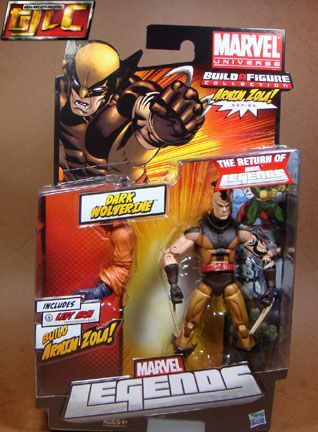 Daken’s left eye seems to be smaller. 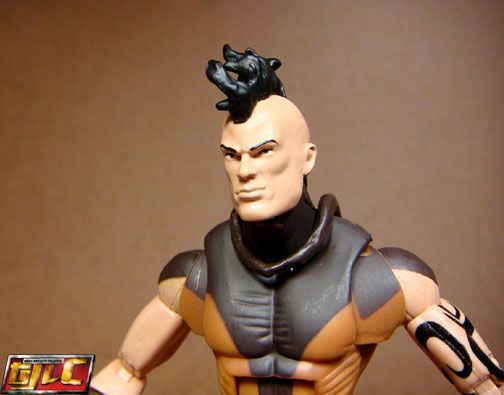 Yeah… I don’t see how that mohawk is going under there either. 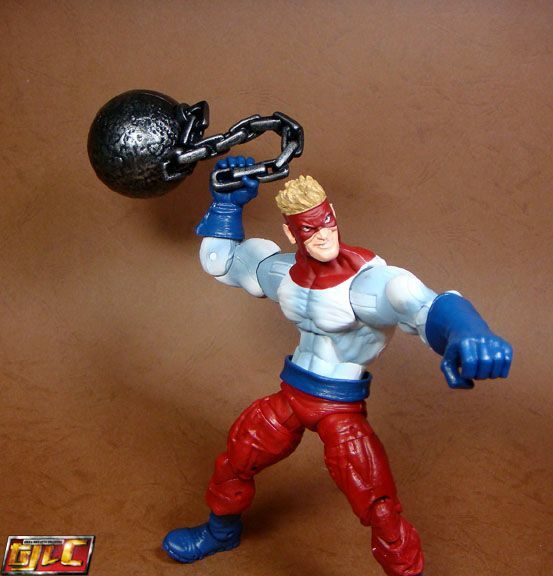 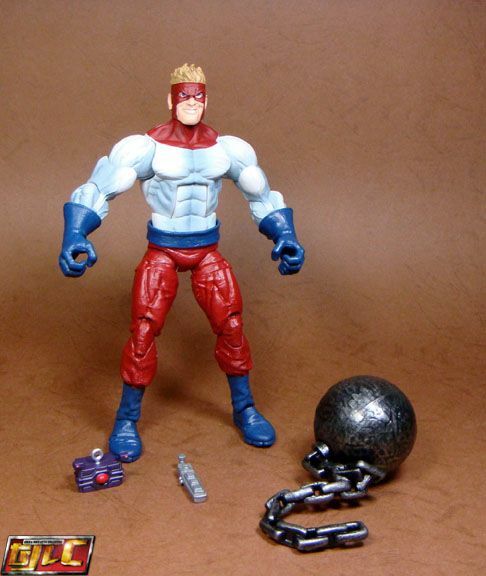 Comes with a demolition ball and chain. 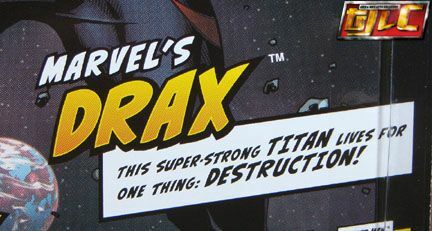 I don’t know, he seems too big, no? 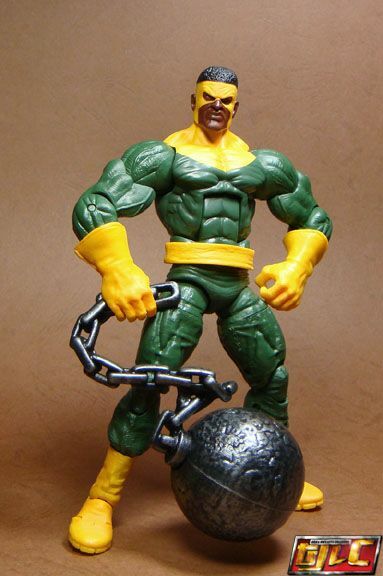 He doesn’t come with any other accessories other than the same ball and chain as Thunderball. 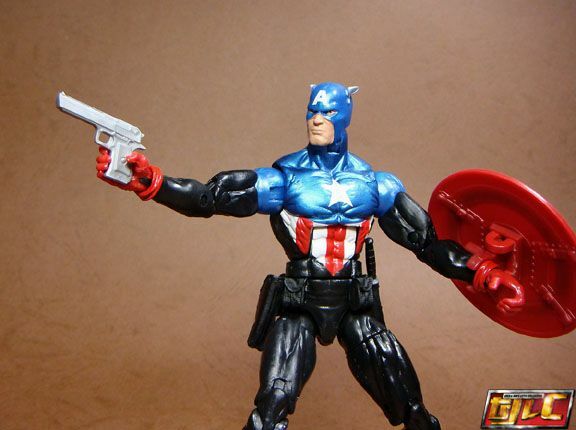 Holster for his gun and sheathe for his knife. 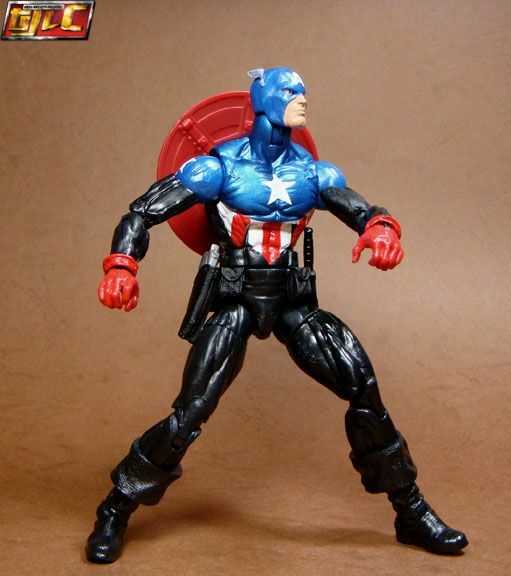 Unfortunately it gets in the way of the leg articulation someawhat. 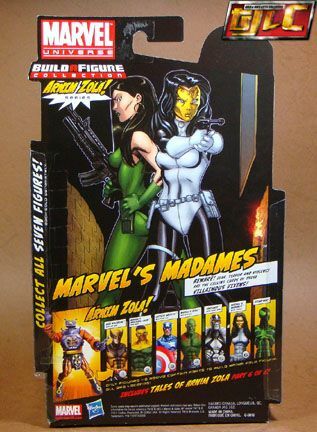 Shield, Shmeild, I’m shooting my mighty bullets! 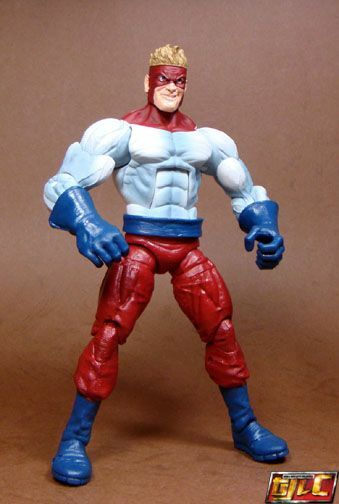 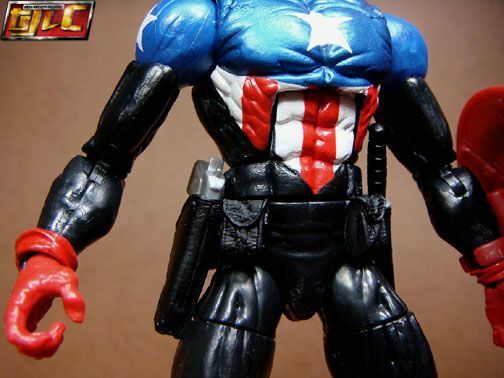 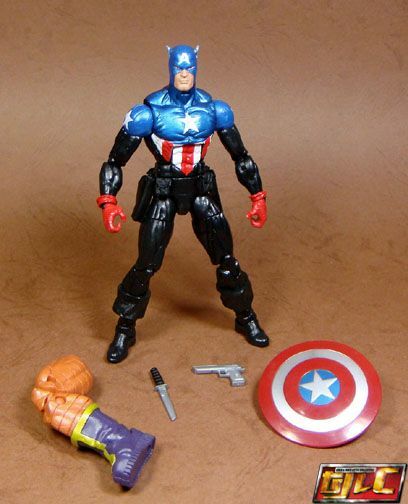 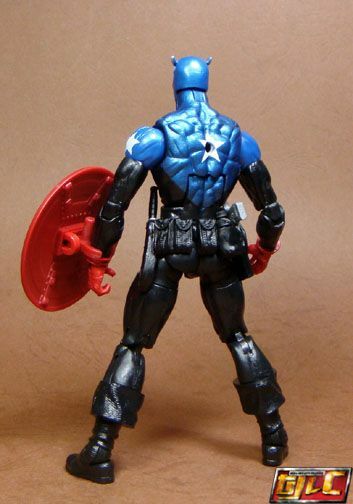 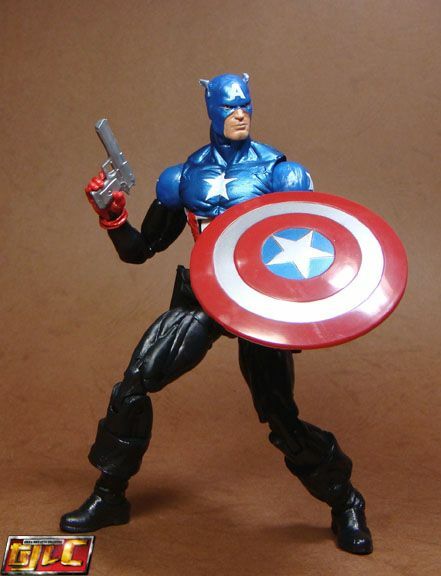 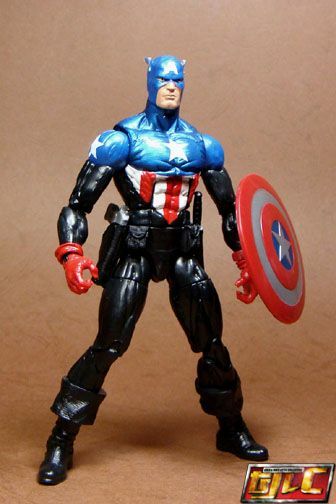 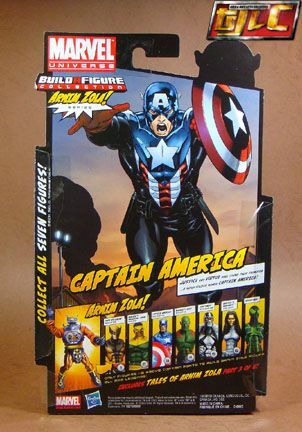 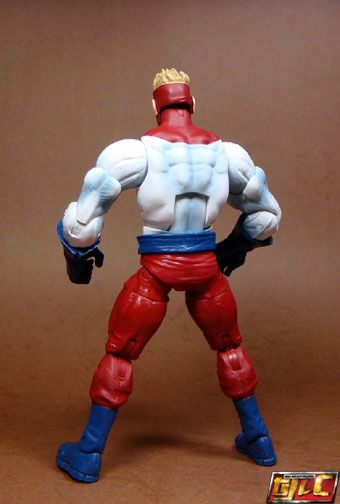 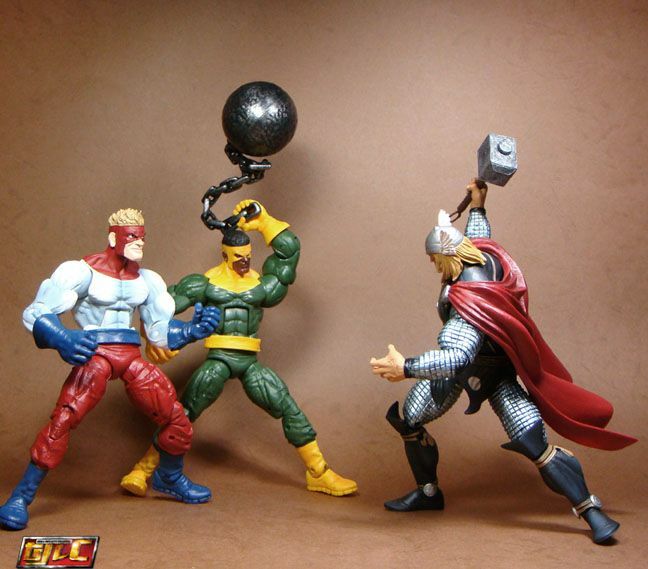 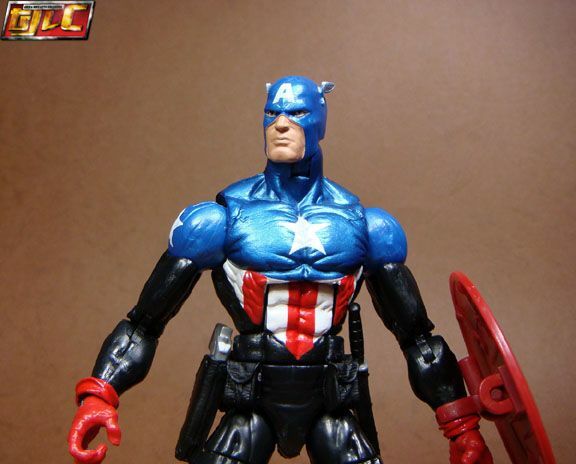 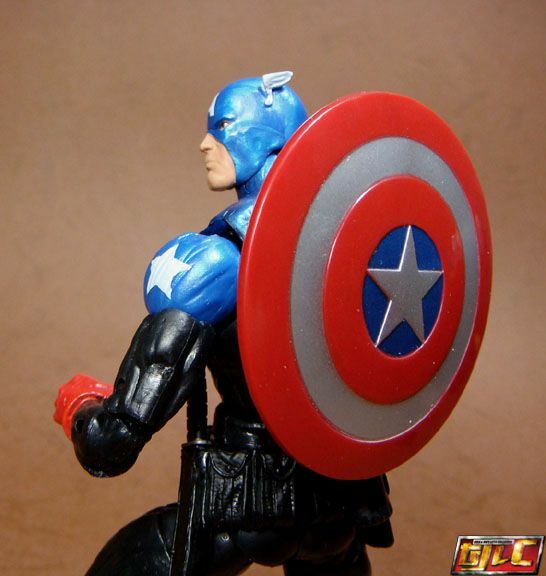 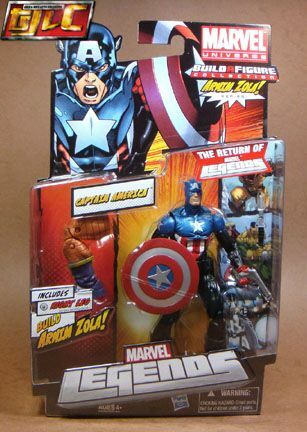 Like the Steve Rogers figure, the shield (which is exactly the same, by the by, ) can be mounted on Cap’s back. 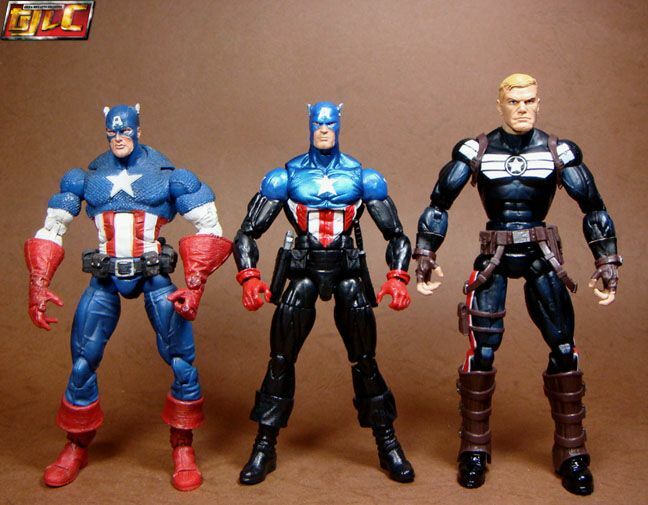 Not bad next to the Face-Off Cap, but Steve Rogers is really too tall. 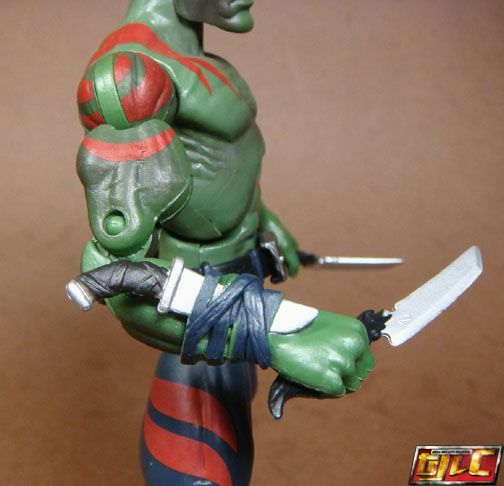 The knife on his right forearm is permanently sculpted on. 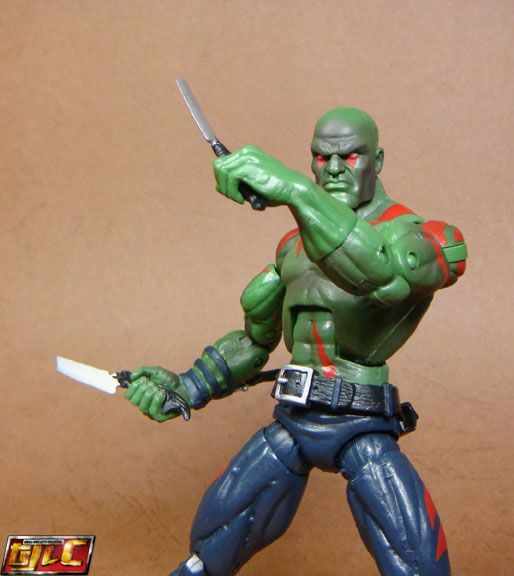 Knives can be stored in sheathes. 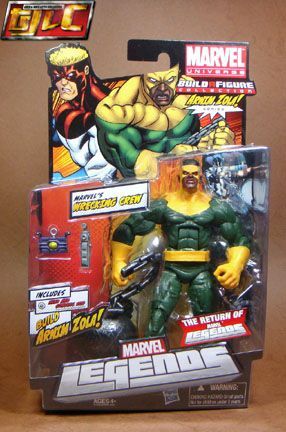 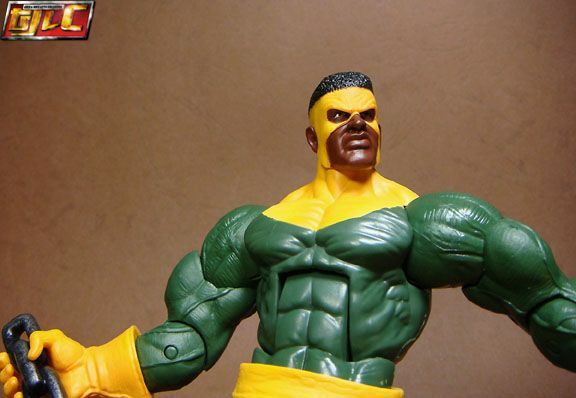 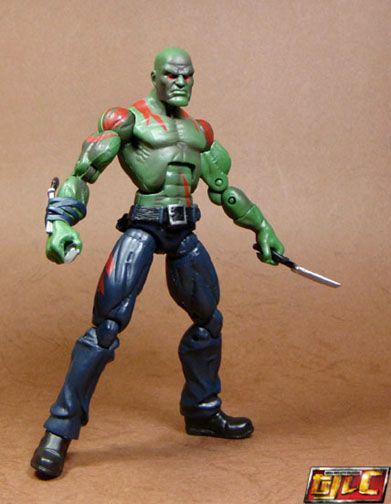 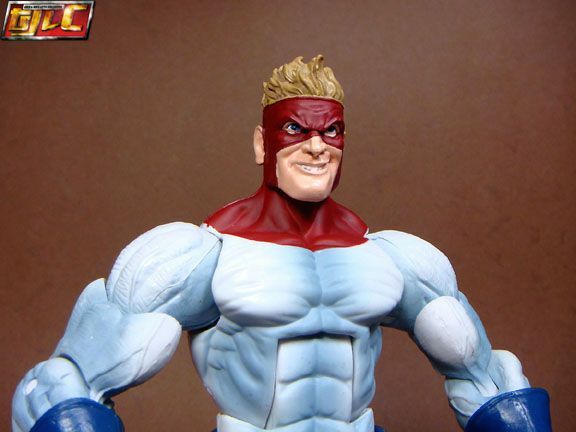 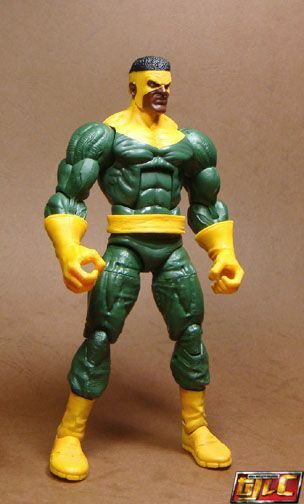 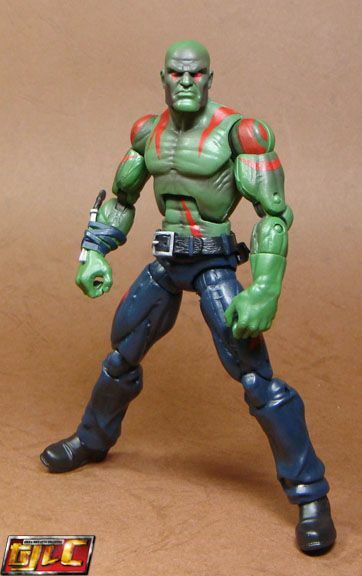 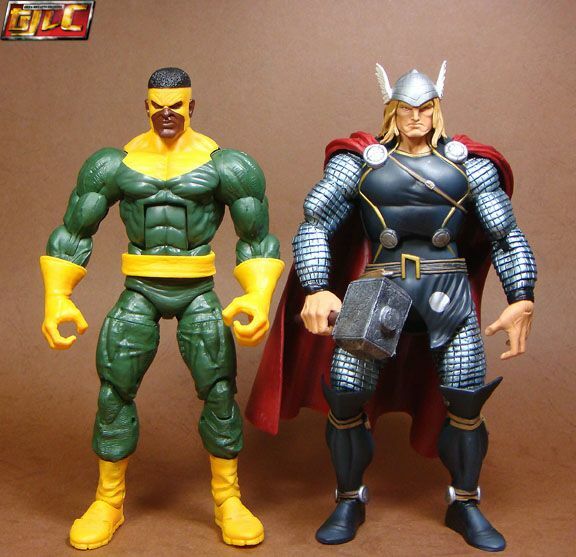 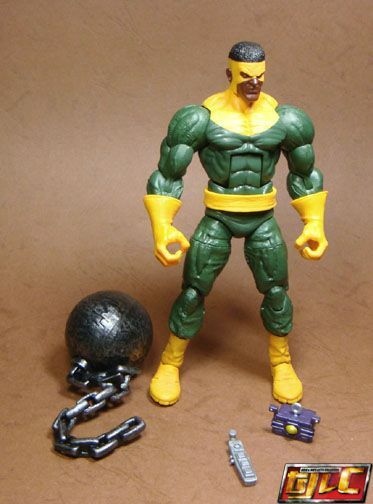 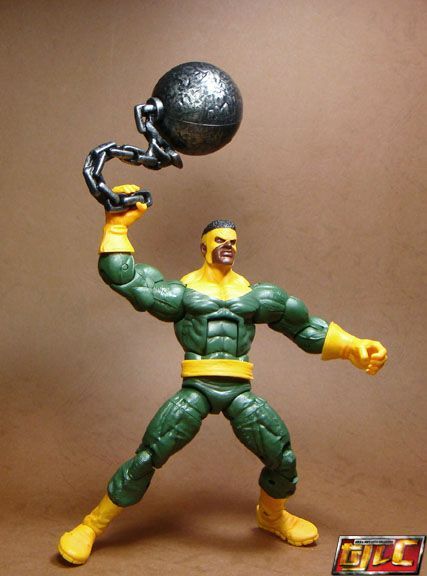 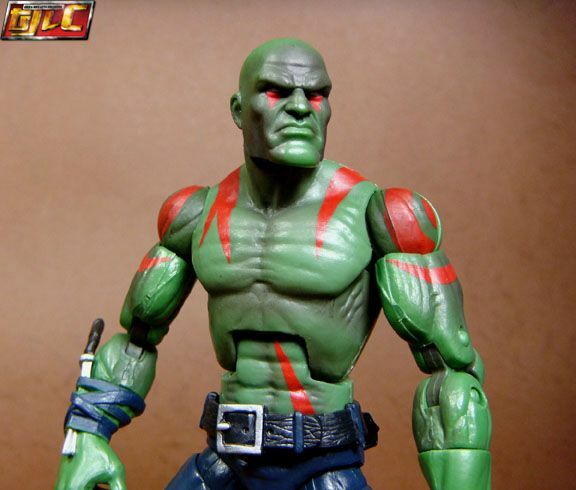 I dunno… is it just me, or does it seem with a little color change and minor retooling, he might pass for Luke Cage? 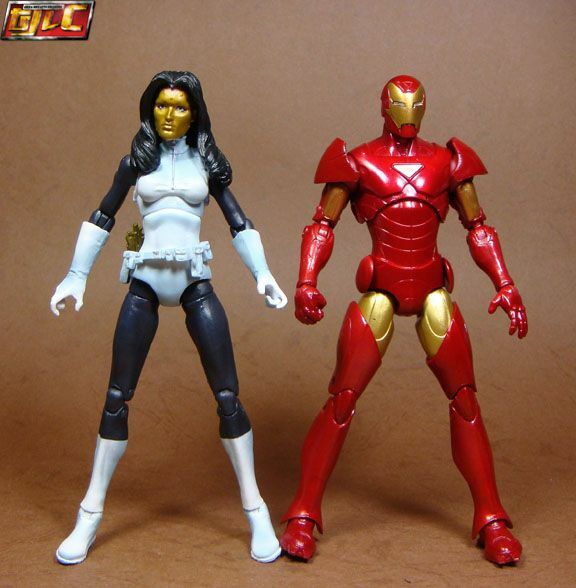 Thankfully, she’s almost as big as Ironman (the two have a history together). 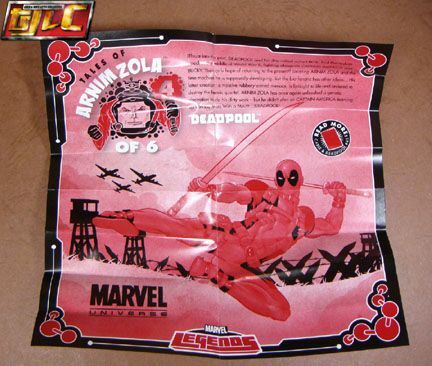 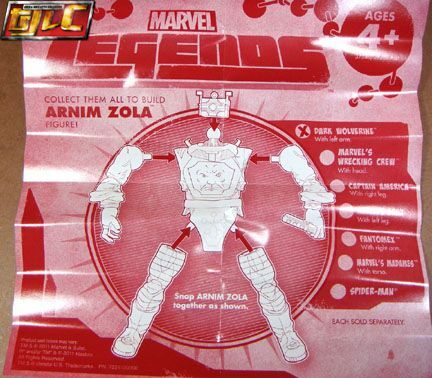 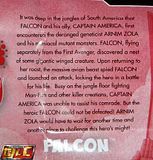 Seriously though, Hasbro needs to get its packaging details done better. 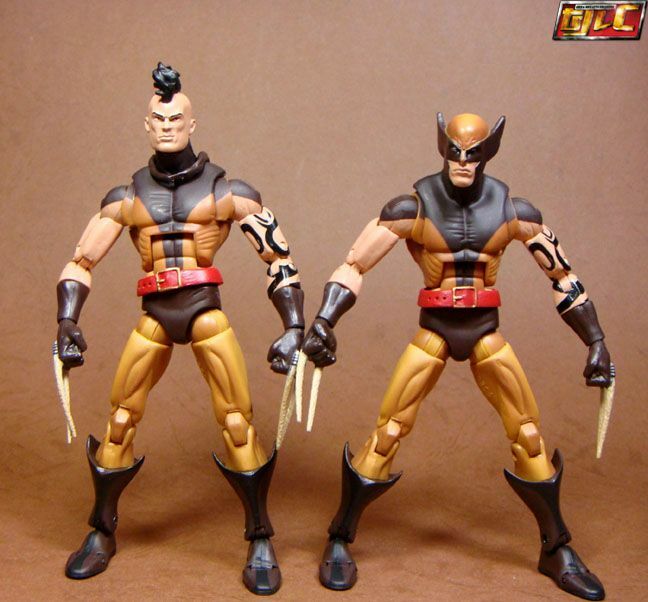 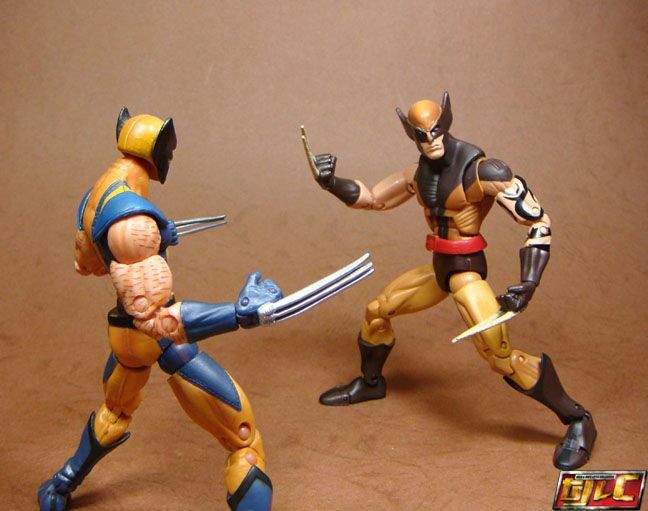 Cutting costs is one thing but using the same card for both figures isn’t right. 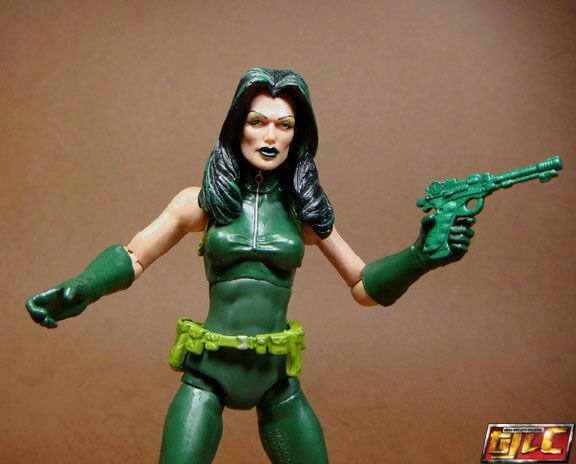 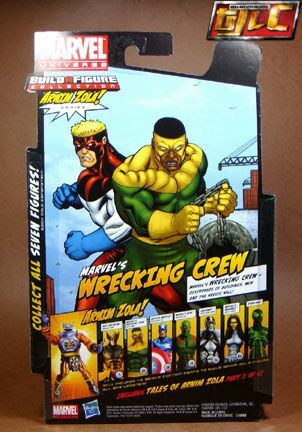 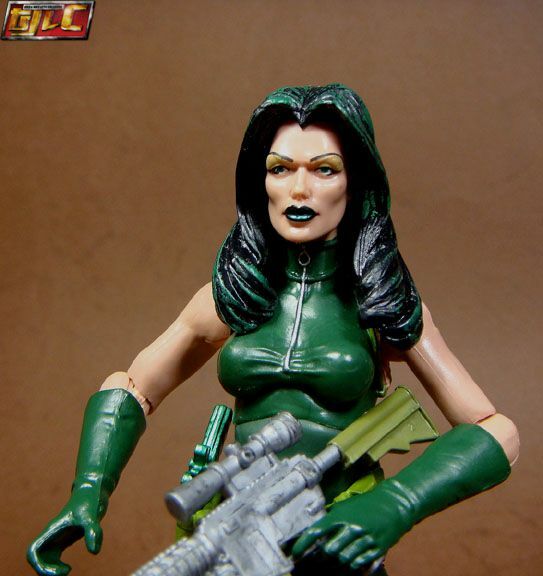 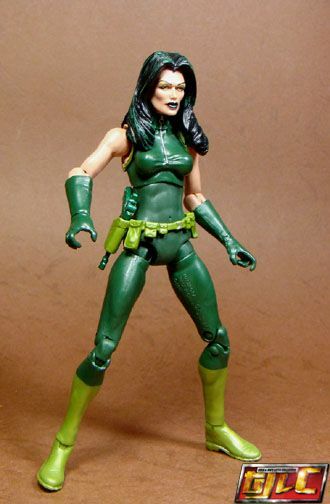 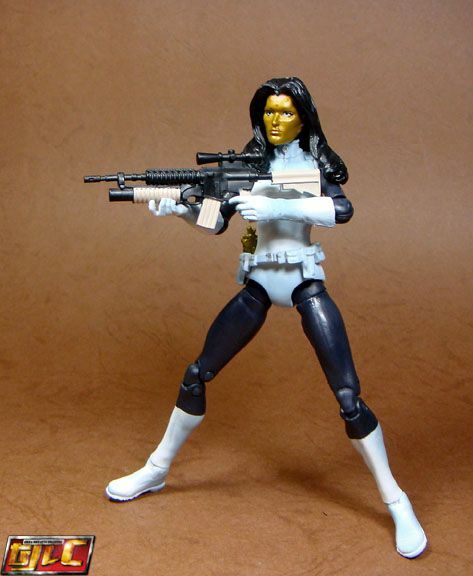 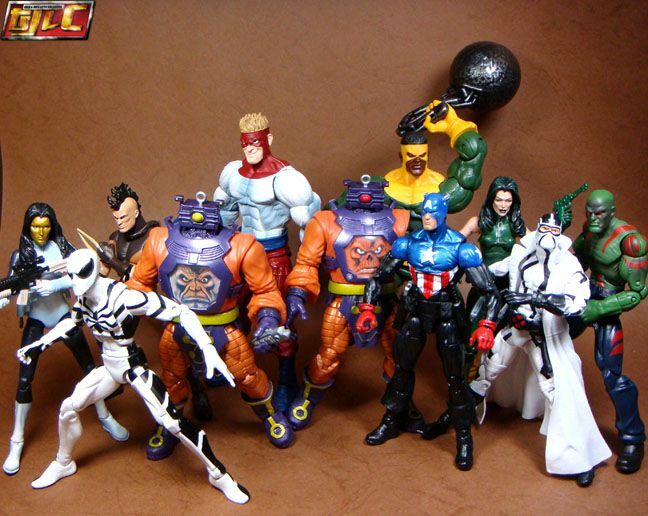 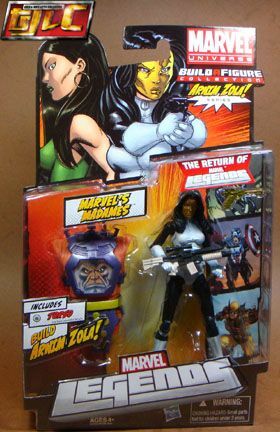 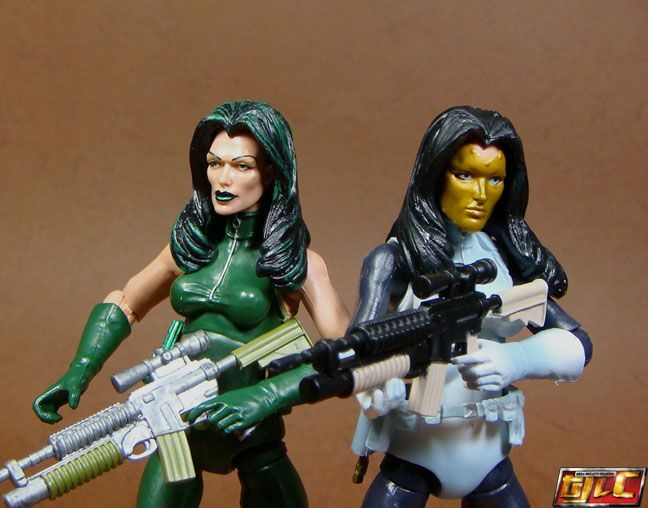 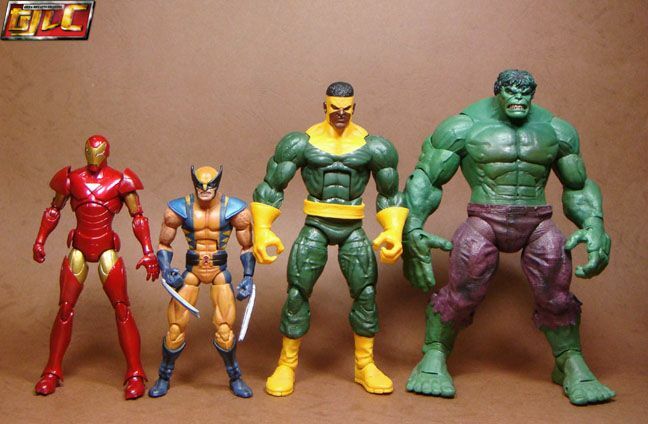 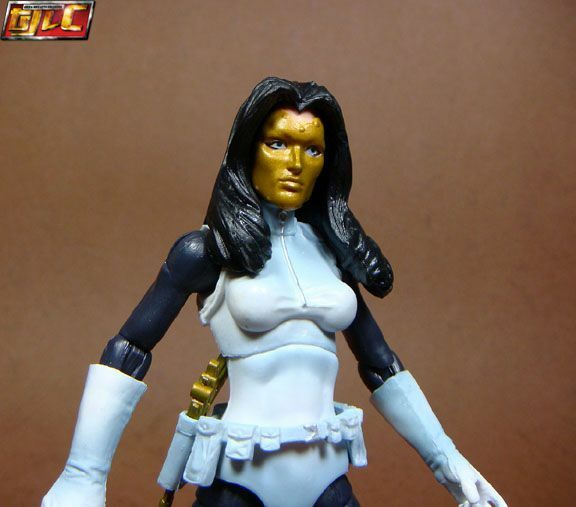 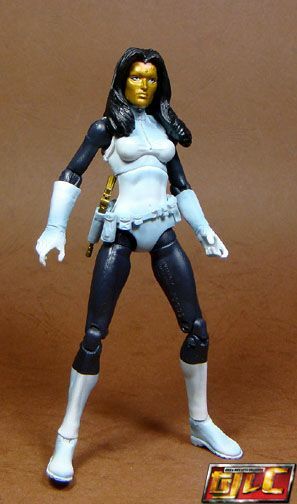 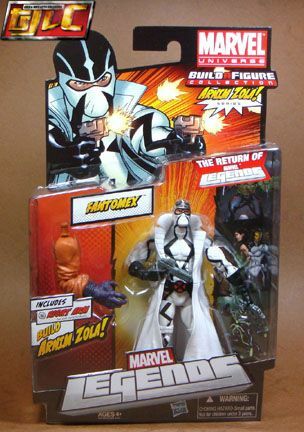 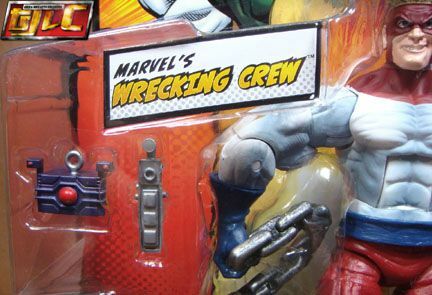 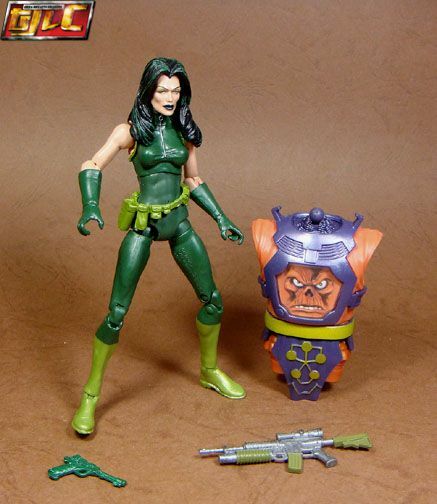 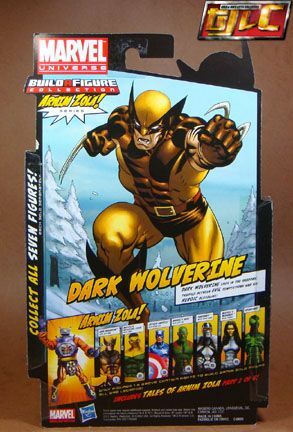 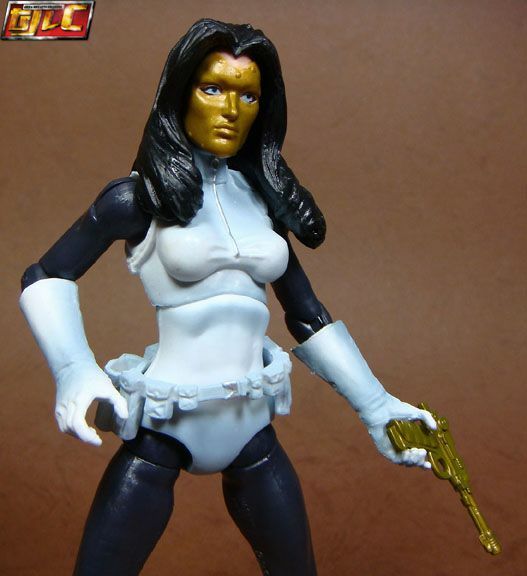 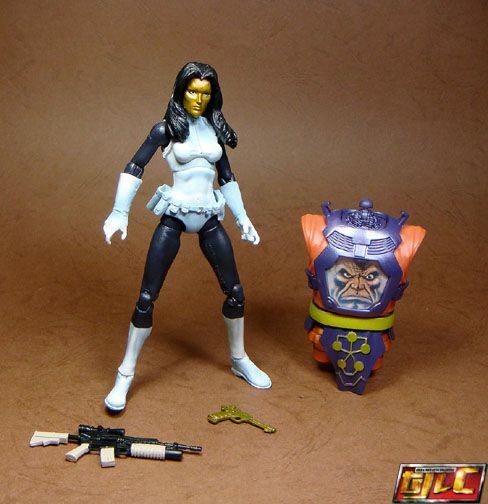 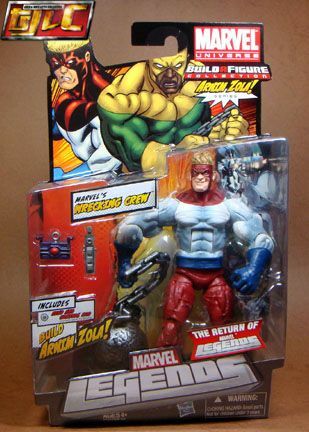 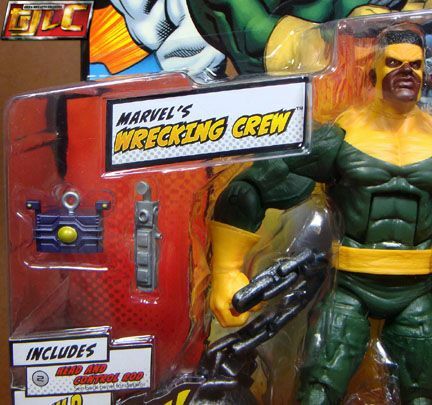 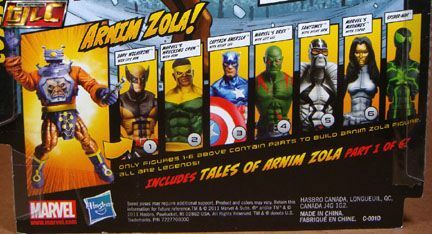 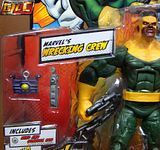 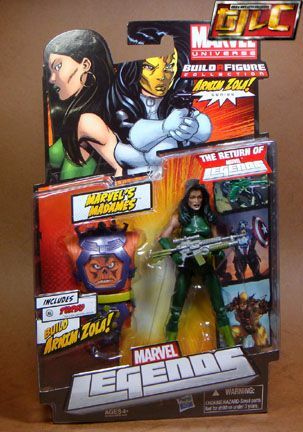 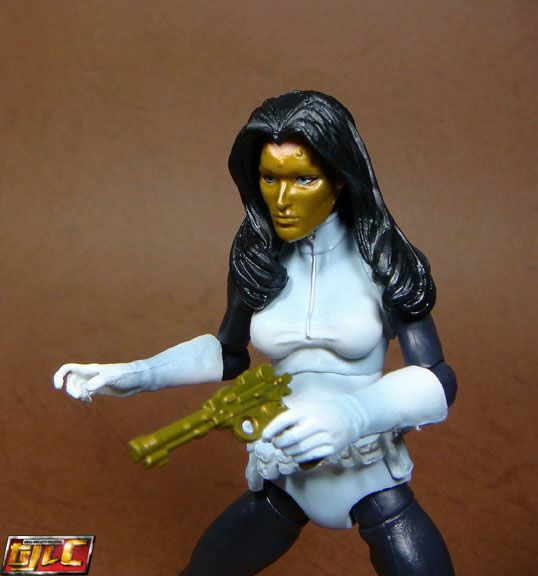 The generic “Marvel’s Madames” heading confuses folks who aren’t really familiar Marvel Characters, the same goes for the “Wrecking Crew” packaging in this wave. 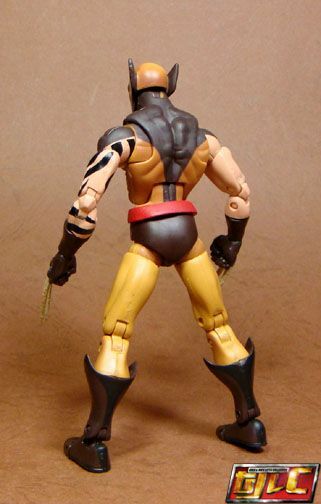 Just shameful IMHO. 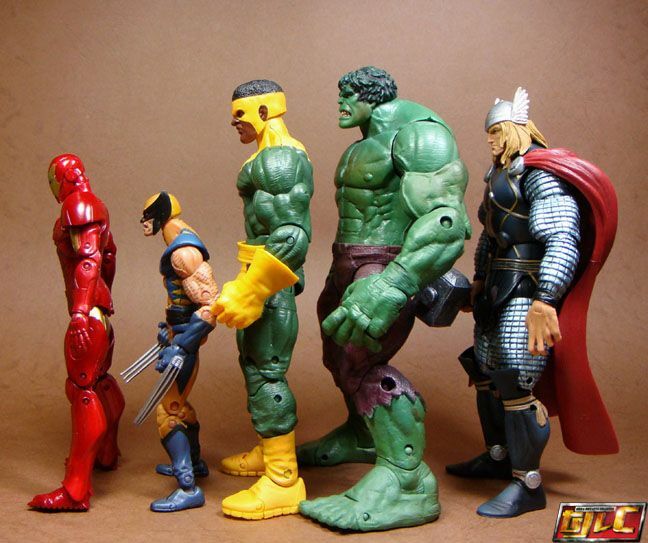 Are they trying to kill the line? 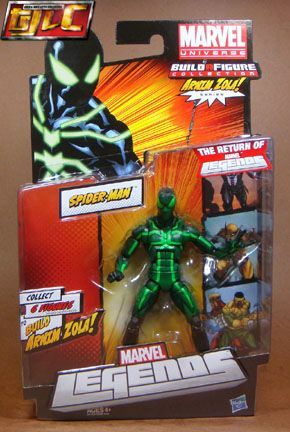 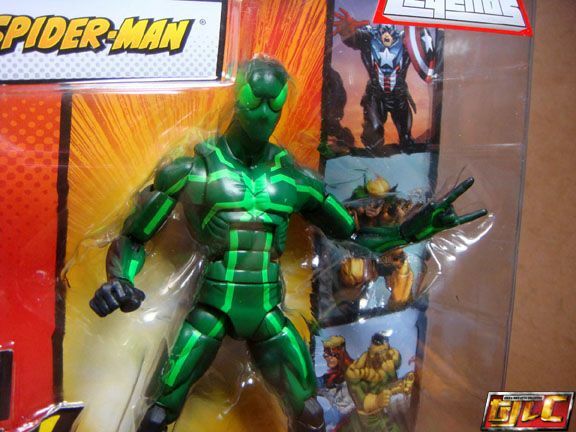 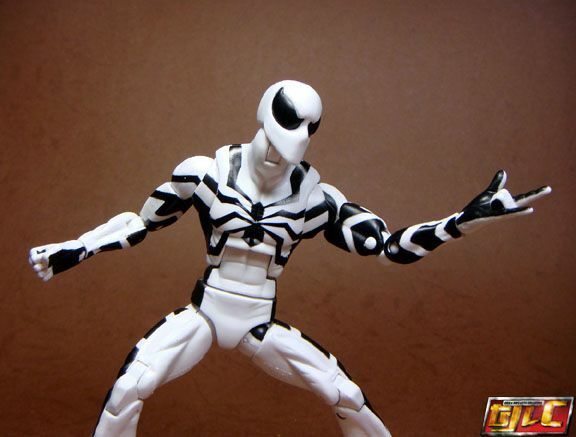 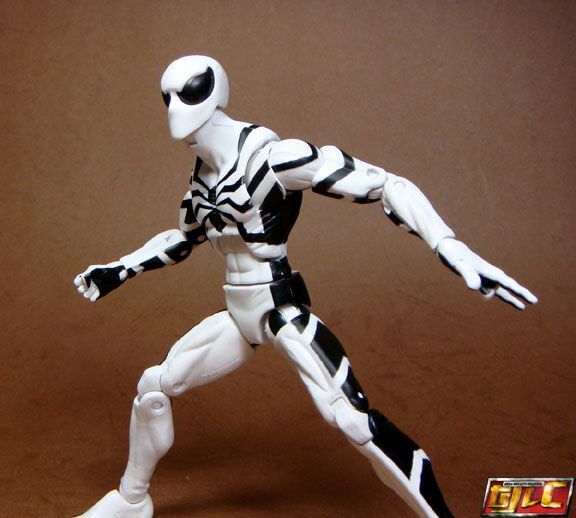 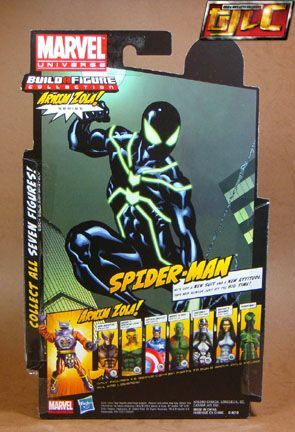 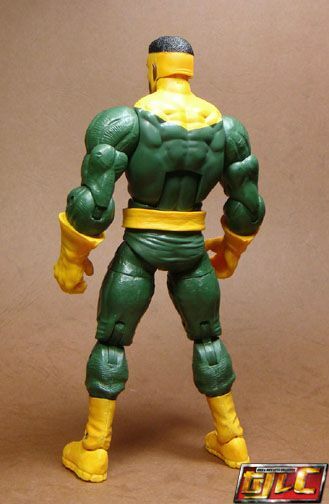 Spidey here is the only figure in the wave that does not come with a BAF piece. 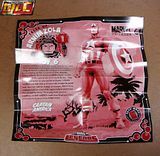 Again, it’s too bad the Big Time variant is hard to find even on Ebay. 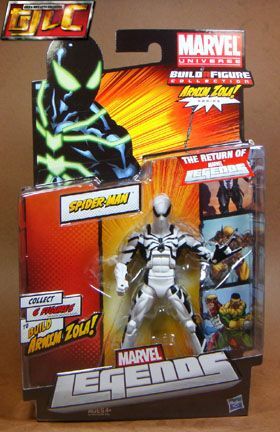 The Big Time suit first appeared in the “Big Time” story arc in Amazing Spiderman, officially called “Spider-man’s Stealth Suit”. 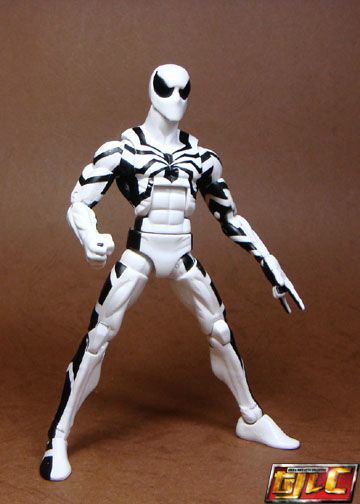 After the events of Spider Island, the costume is currently in the hands of the new Scarlet Spider, Kaine Parker (yes, the Peter clone is now healed and building a new life in Houston, Texas) with new colors. 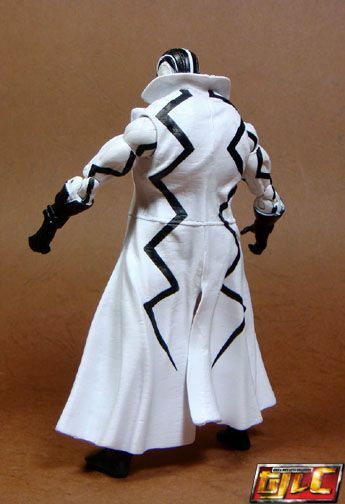 The suit has stealth cloaking tech, as well as sound-dampening abilities (for sound-based attacks like the new Hobgoblin’s weapon). 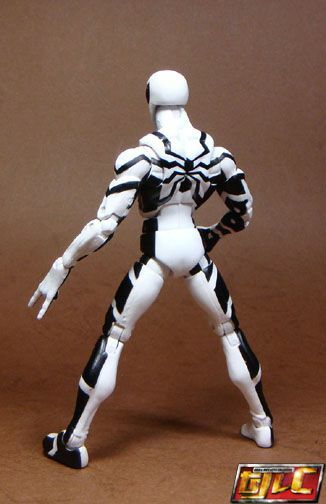 It has been suggested that the suit does need to be recharged from time to time. 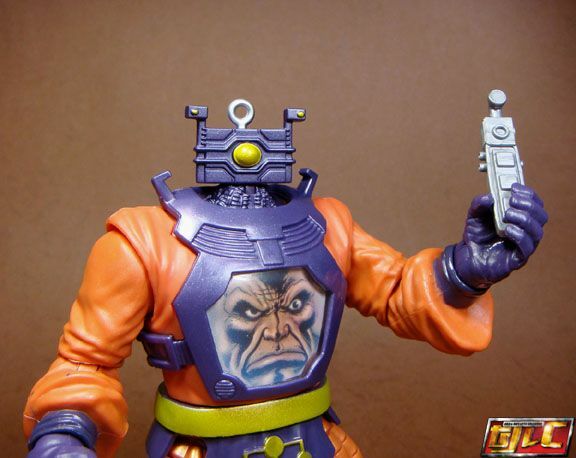 His only accessory, a remote control… wow.. real epic. 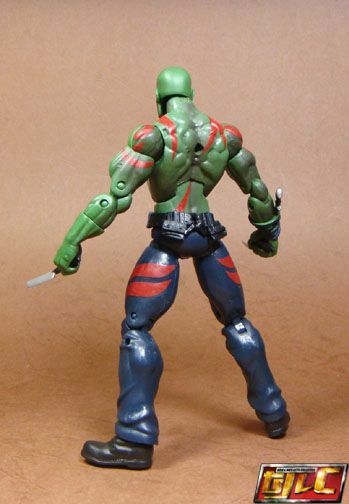 I don’t recommend trying to pull apart the arms and legs to refit onto the Red Skull torso, since the joints lock in pretty damn well, there’s almost no way to pull them out without damaging the Arnim torso. 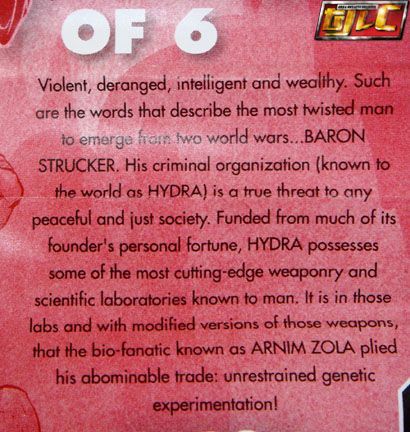 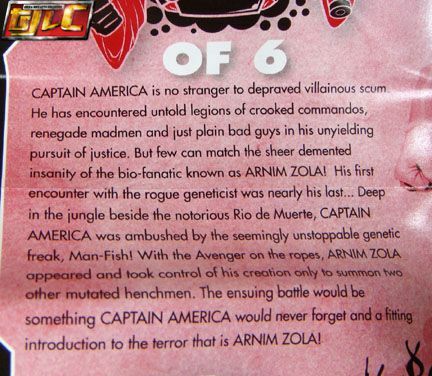 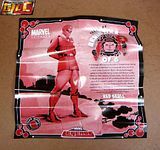 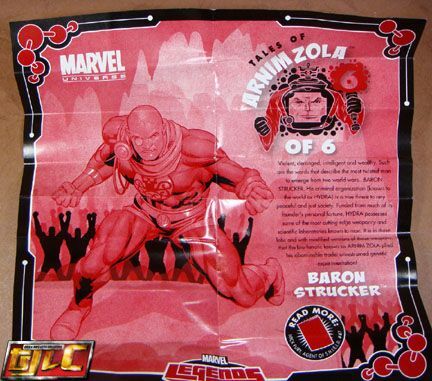 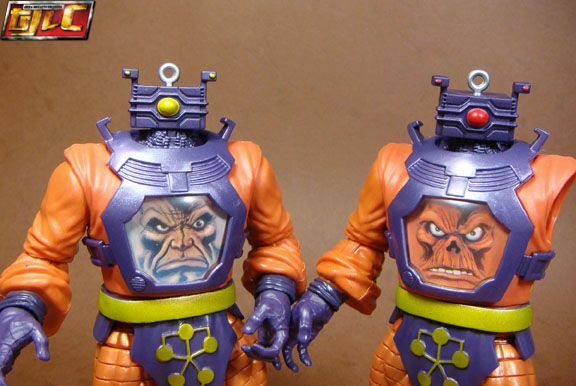 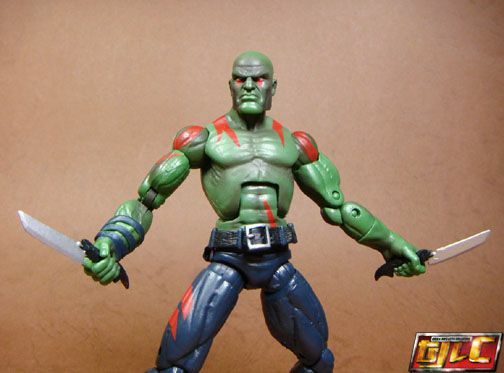 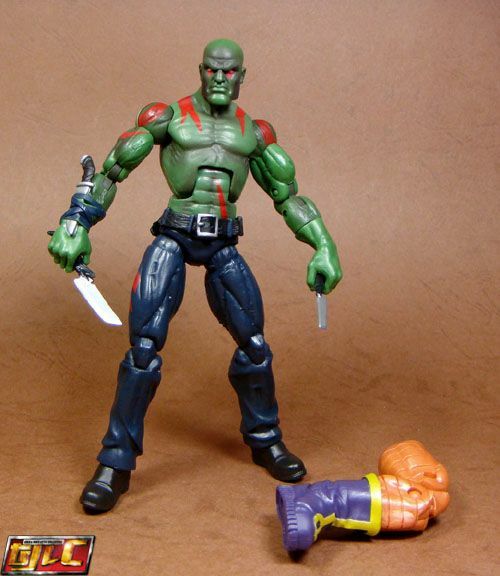 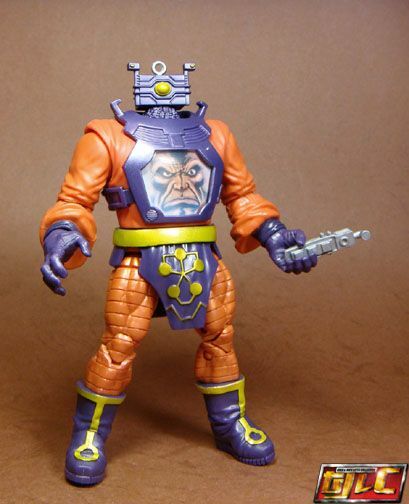 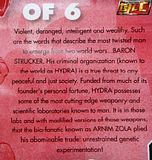 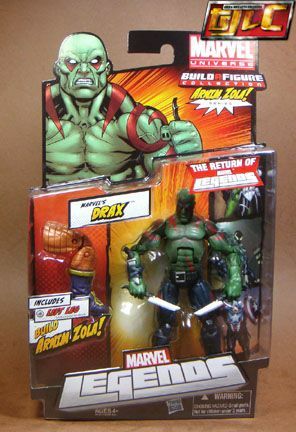 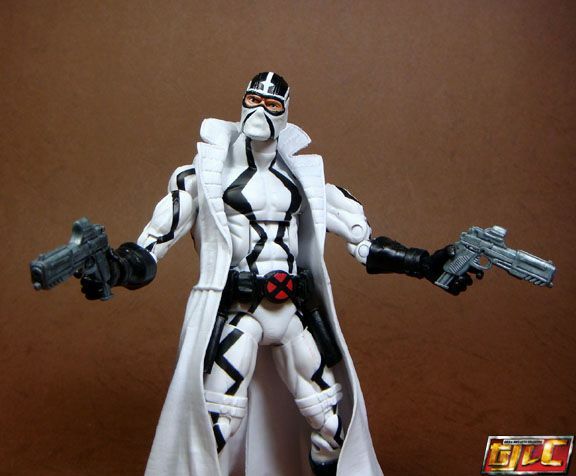 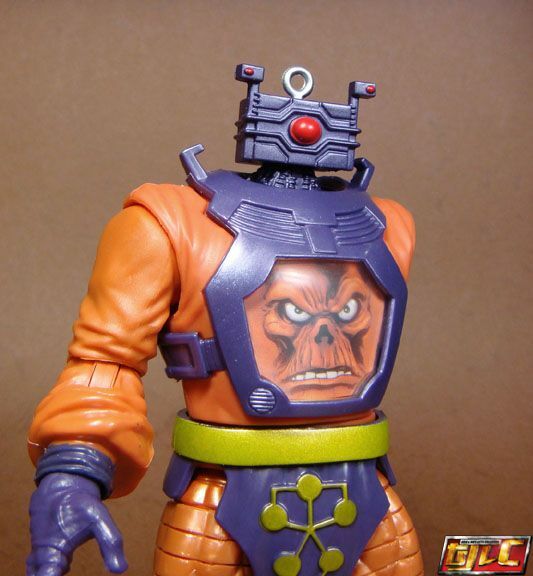 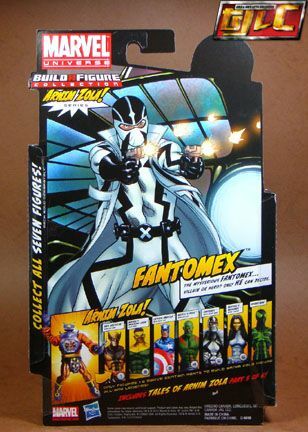 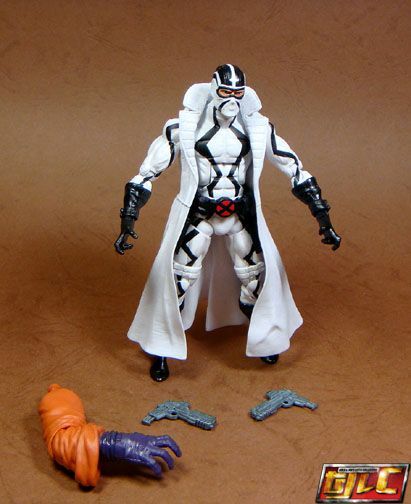 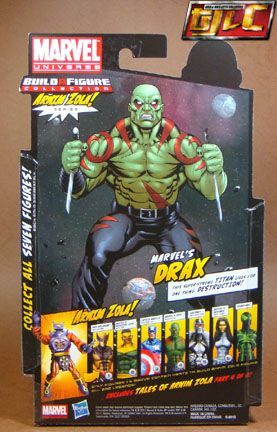 Likewise, I’m not sure if getting a second set to build a complete Red Skull is a good idea too, since his costume is supposed to be white, not orange, after the body swap.